Chalong Concrete, Complete service for construction materials & equipments manufacturer. They grow more rapidly in sphere of construction industry in Phuket covers surrounding area. Since 1992 Chalong Concrete has served at every group of customer until now with the quality standard products and deep experienced personnel who are specialize in this field. Additionally, modern technology and management experience. 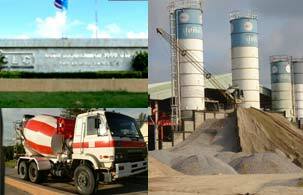 Today Chalong Concrete offers customer service centers cover Phuket, Phang-Nga, Krabi area for your convenience and promptitude and save money. Furthermore, our newest factory at Amphur Kok Kloy (Phang-Nga province) that creates every product by a modern technology and serves on the quality standard process. A factory can make quickly a lot of products per time. Our staff is proud and promises to give our customer the best thing. Technology for Environmental Conservation, Chalong Concrete accentuates in a policy of environmental conservation. As well as we consider for technological procedure, process and providing the finest service about make at least pollution on the environment on ISO 9002 policy.